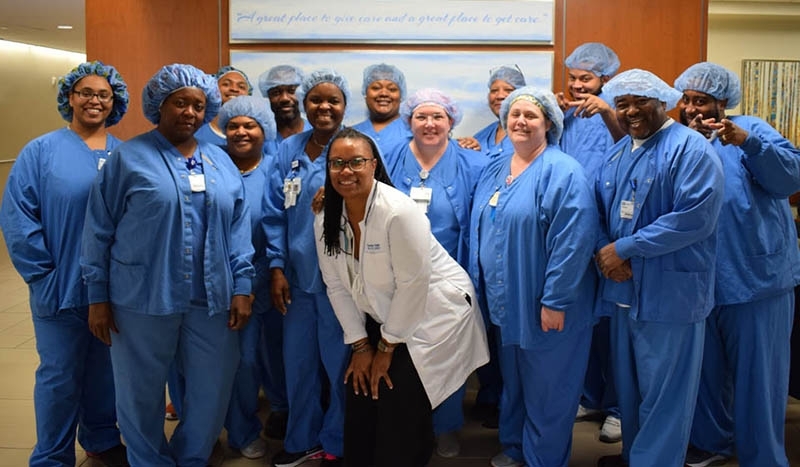 After receiving a perfect score from a Joint Commission audit this fall, Christina Daniels Dickerson, CRST, knew exactly what helped lead to the rating for Duke Raleigh Hospital’s Sterile Processing unit. It’s a small thing among many which Daniels Dickerson believes has built stronger connections for teamwork and ownership in all she and her colleagues do. “It’s like a breath of fresh air,” added Penny Stephens, CRST, also a sterile processing technician IV. The duo said by celebrating the goals of 1 Duke Periop like respect, teamwork and ownership, communication among coworkers is stronger than ever. It shows up in daily huddles and before surgical cases. Teammates listen to each other and accept a diverse range of ideas and opinions to care for patients better. Stephens said it comes from a place of seeing coworkers as family. “Being respectful and friendly toward each other is what makes the day a success,” she said. Especially if there’s some dancing involved.